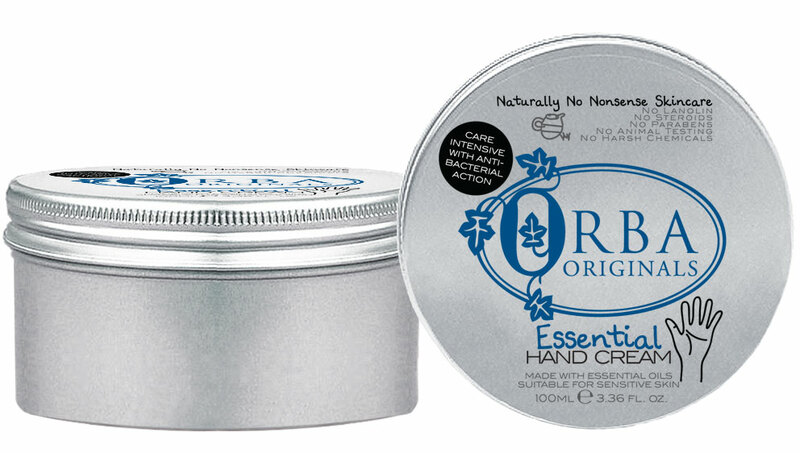 Essential Hand Cream Natural Essential Hand Cream  - £12.99 : Orba Originals - Naturally No Nonsense Skincare! Care intensive hand protection formula with anti-bacterial action. A delightful cream for hands delivering effective anti-bacterial protection with the aid of the natural antiseptic properties of honey. Additionally rich in essential and pure oils and natural vitamins D and E this gentle moisturiser leaves no sticky residue and is ideal for every day use. Orba Originals' Essential Hand Cream provides the first line of defense against everday germs and bacteria. The unique blend of essential oils harnesses the soothing anti-bacterial properties of honey to deliver protective anti-septic care while the powerful healing properties of vitamins D and E help to promote core strength and skin elasticity. This light cream is easy to apply and leaves no oily film. Packed with essential oils it is an intensively moisturising cream ideal for all skin types, particularly beneficial for dry skin and formulated to leave skin silky and soft. All round protection for hardworking hands. Apply to clean hands. Use twice daily - or as required with exposure to contamination or irritant substances. Massage into all areas of each hand. Aqua (WATER); Cetyl Alcohol (COCONUT/PALM KERNEL OIL); Isopropyl Myristate (and) Stearic Acid (and) Cetyl Palmitate (and) Coconut Acid (and) Cetearyl Alcohol (and) Glyceryl Stearate (and) Potassium Stearate (and) Potassium Cocoate (and) Sodium Stearate (and) Sodium Cocoate (COCONUT/PALM KERNEL OIL); HONEY; Vitamin E OIL; Vitis Vinifera (GRAPE SEED OIL); Persea Americana (AVOCADO OIL); Simmondsia Chinensis (JOJOBA OIL); Prunus Armeniaca (APRICOT KERNEL OIL); Oenthera Biennis (EVENING PRIMROSE OIL); Borago Officinalis (BORAGE SEED OIL); ALLANTOIN; FRAGRANCE (NATICIDE PERSERVATIVE).